The head of Sainsbury's has attacked government plans to make temporarily extended Sunday trading hours permanent. Chief executive Justin King said: "Maintaining Sunday's special status has great merit." It was not a "magic answer" to the UK's economic problems, he added in a letter to the Sunday Telegraph newspaper. Supermarkets and large stores have been allowed to open for longer during the Olympic and Paralympic Games. Under current legislation, shops in England and Wales measuring more than 280 sq m (3,000 sq ft) can open for a maximum of six hours between 10:00 and 18:00 on Sundays. However, the government relaxed these rules during a seven-week period covering the Games in order to serve the expected rise in tourists and shoppers. Supermarkets have been able to choose their own opening hours across England and Wales. However, Sainsbury's has only extended opening hours at 30 of its 1,000 stores. "Maintaining Sunday's special status has great merit for our customers and our colleagues, and relaxing Sunday Trading laws is certainly not a magic answer to economic regeneration," said Mr King. Communities Secretary Eric Pickles was quoted in last weekend's press saying he would be willing to look at the impact of the temporary relaxation on trade, following calls from the Institute of Directors (IoD) business lobby to end Sunday trading restrictions. 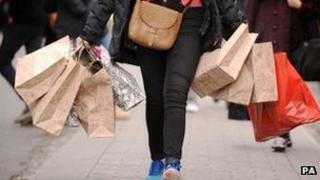 Mark Wallace of the IoD said: "We know there are people out of work or underemployed who desperately want more opportunities and we know there is an appetite among consumers to shop during normal hours on Sundays, so it is silly to have a rule that holds both groups back." However, other groups have already voiced their opposition to longer trading hours. In a separate, joint letter also to the Sunday Telegraph, the general secretary of the Union of Shop, Distributive and Allied Workers (Usdaw), the Bishop of Oxford and the chief executive of the Association of Convenience Stores said they had been "alarmed" to hear that ministers were considering making the change permanent. "Longer opening hours won't put more money in the pockets of shoppers," said John Hannett of Usdaw, the Right Reverend John Pritchard and James Lowman. They also highlighted the "detrimental impact" on family life. The Keep Sunday Special campaign said: "David Cameron came into government promising to make this country the 'most family friendly in Europe' but over one million families have at least one parent working on both weekend days, meaning they have little time to spend with their children."